Chongqing style hotpot, has had a long history, and has been a unique tradition only found in the mountain city of Chonqing. It is a symbol of food culture in the mountain city, has been no. 1 family hotpot favourite from home and abroad. 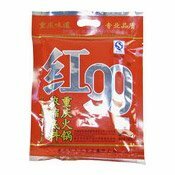 Red99 concentrated chongqing hotpot base seasoning, was in deep mining traditional formula, on the basis of embodying the essence of modern hotpot culture. Using selected high-quality raw materials, the combination of traditional and modern manufacture technology to well retain the taste and enhance the flavour of Chongqing hotpot hotness, spiciness, freshness and tastiness, concentrated all into one. Red99 hotpot base seasoning is well made for the unique flavour of the authentic Chongqing hotpot dish, which can also be used for other Sichuan cuisines. It saves you time, trouble and worry. It's convenient and fast. It is your top choice of modern cooking for gourmet home or restaurant cuisines, and the most favourite gift from chongqing to family friends. Simply enter your details below and we will send you an e-mail when “Hot Pot Concentrated Base Seasoning (紅九九重慶火鍋料)” is back in stock!